UPDATED: Mon., Oct. 22, 2018, 8:44 p.m.
MIAMI – When newly signed Miami Marlins prospect Victor Victor Mesa was asked Monday how soon he’ll be in the major leagues, Derek Jeter leaned over with a smile and a word of caution for the young Cuban. The futures of Mesa and his younger brother, Victor Mesa Jr., may be difficult to project, but the Marlins eagerly signed both outfielders. 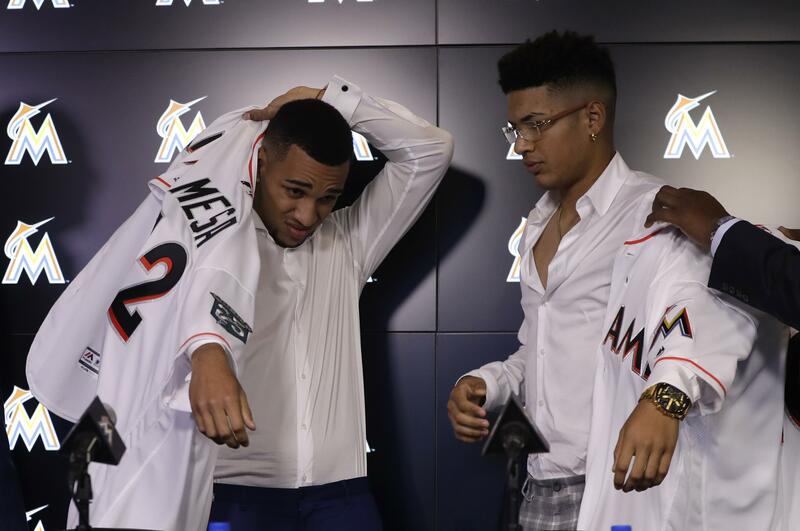 They left Cuba last spring to pursue major league careers, and their contracts were announced at a news conference Monday at Marlins Park. Victor Mesa Jr. also posted an Instagram photo of himself with former Marlins All–Star third baseman Mike Lowell. Published: Oct. 22, 2018, 8:27 p.m. Updated: Oct. 22, 2018, 8:44 p.m.